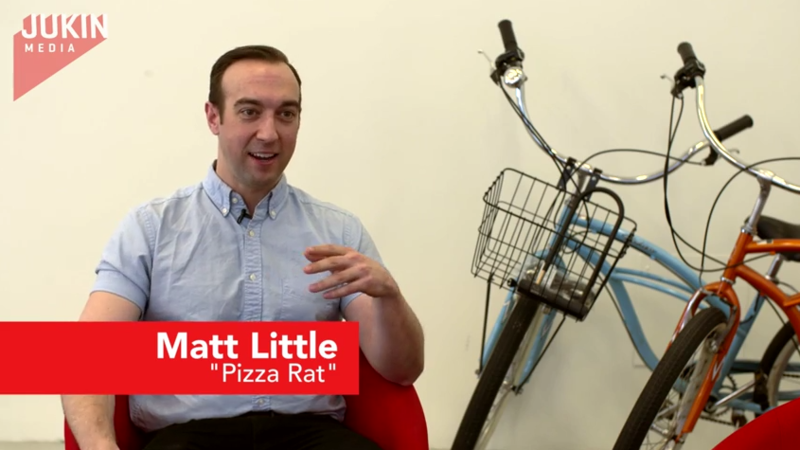 Meet, Matt Little, the Man Behind the Video of a Slice of Pizza and a Rat. One Sunday night in the fall of 2015, Matt Little and his friend Pat were walking in the East Village from a comedy theater in New York. Exhausted after a long day, the pair boarded the subway platform to head home for the night. What Matt found on that subway platform changed his life. The thing that he saw -- which is something that he’d never seen before -- was a rodent carrying a full slice of pizza down the stairs. Alertly, Matt pulled out his camera phone and recorded the quick but oddly memorable encounter. The next day Matt uploaded the video to YouTube and the rest is history. In short, the video exploded. The rat carrying a slice a pizza quickly became known as “Pizza Rat” and the hottest topic of conversation on the Internet. The mainstream media quickly caught on, with outlets like Jimmy Kimmel Live, The NY Post, and CNN, jumping into the conversation. Months later, BuzzFeed dubbed Pizza Rat the “2015 Rodent of the Year”. Pizza Rat even has its own Halloween costume. To date, the video has 9.3 million views on YouTube and has inspired dozens of fan accounts on Facebook and Twitter. As owner of one of the biggest viral video sensations the web has ever seen, Matt Little has a perspective unlike anyone else’s. We caught up with him and got the inside scoop. We were dead tired and could only think about is getting sleep. Once we get onto the subway platform, we swipe through, and we walk to the stairs. I look down to my left and I see a rat dragging a slice of pizza twice its size. I look at Pat and say “Okay, this is happening” and he says “OH YEAH!.” Once I shot the video and we kinda backed away from it slowly to see if he would grab the slice and then drag it off into the night or wherever rats go after they steal pizza. And he scurried away so I turned off my camera. The next day I was riffling through my phone looking for a different video and saw that and realized “oh, I remember I shot this last night!” so I threw it up online. What made you pull out your camera to record? I told myself to take my phone out to record. I wanted to show my friends that I saw something this crazy because I knew they wouldn’t believe it. Did you get to see your video on the news or TV? The next day it was on all late night shows, it was on the daytime shows. By the end of the week, it’ was on variety shows, and by the weekend it was infiltrating cable. What do you think about your video now? It’s cool. It really took on a life of its own and through the rest of the day I was just, I was more being drug around by the tale of the rat. I find myself 8 months later and there’s still life on this video that a lot of people told me the first week “Just enjoy that while it lasts because the internet has a memory of about a week .” and I thought “Oh, well it will be a fun week!” and here we are and it’s still popping up everywhere, it was just on a TV show on Netflix that I love, that I really freaked out about. So, it’s been a blast! Do your friends and family know? Do they treat you like a celebrity? No. My friends had so many questions. From the minute I posted the video, they were asking, “What is going on here? What is this? When did you see this?” It was crazy. Why did you choose to work with Jukin? When Jukin first contacted me, I had no idea what a licensing company did or does. You guys got on the phone with me and patiently sat through like a half hour of questions that I had. It really relaxed my mind. They helped me realize that if I am going to license my video, Jukin is the right company to work with. With Jukin, you can expect an amazing team that will pretty much answer any questions you have about licensing a video. I saw that Jukin had the connections and influence that will help get your video seen by as many people as possible. What part of this experience impacted you the most? On one hand, it’s the most amount of money I’ve made from the least amount of work I’ve ever done. On the other hand, I had a girl come up to me at work and told me that her dad had this serious PTSD syndrome. He watched this video and became obsessed with it. She told me this was the thing that opened her family up again and this was between thanksgiving and Christmas was the best Thanksgiving her family had in a decade because they felt like they had their dad back. I don’t even know what to say to something like that. You can’t measure the value of being able to put something out in the world that touches someone that way. I was able to do that with something as simple as a rat dragging a slice of pizza down the stairs. You can’t put a price tag on that and that is the type of experience I think I am going to take with me for the rest of my life.